BELLEVILLE – Five people shared their personal stories of turmoil and triumph Sunday night at the Brake Room as a fundraiser for Quinte Immigration Services. A small group of public relations and event management students based their fundraising idea off of the Human Library, an organization dedicated to ending stereotypes and prejudices, according to its website. At a human library event, people get an opportunity to speak to others they might not run across in their daily life. “We just like the idea of breaking down barriers and getting people to tell their story,” Holly Marshall, one of the event’s organizers, said. At the Brake Room cafe in downtown Belleville, five tables were set up in the middle of the open space. Participants came to the venue, got a hot drink, and sat down at one of the tables and listened to the personal story of a complete stranger. Kate Buttaro, graduate of the child and youth care program at Loyalist College, told her story about being a teen mother. She decided to share her story so other woman in that situation don’t feel like they can’t achieve their dreams and goals just because they’re a young mother. “You can still lead a successful life if you’re a young mom,” she said. All of the proceeds from the entrance fee went to Quinte Immigration Services. Marshall said it’s one of the charities in Belleville that her group felt most passionate about. 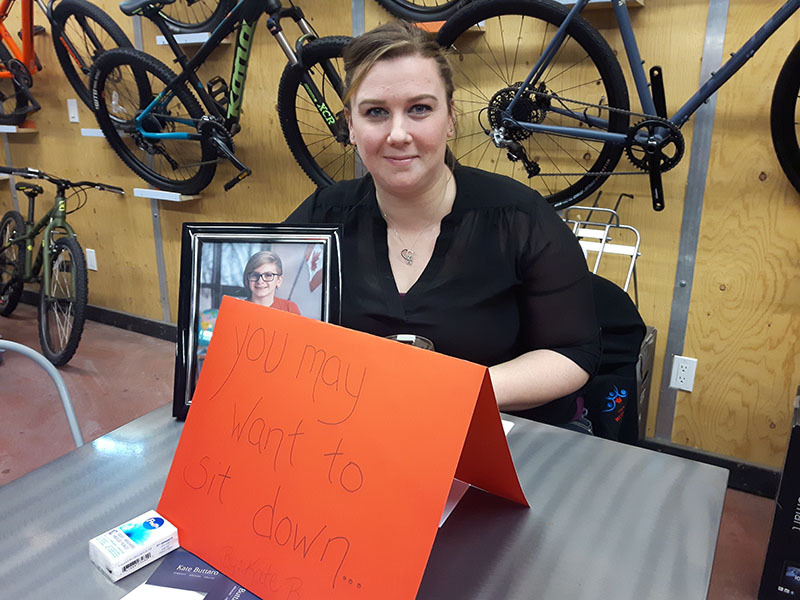 “We thought hey, that might be a cool idea for a fundraiser, especially one for an organization that works with people in the community,” she said. Cameron MacLean, public relations and event management student at Loyalist College, told his story about his experiences with the Magic Wheelchair project and how he brought happiness to a child on Halloween. That project makes costumes for children in wheelchairs. “You can’t just go out and off the shelf buy a costume for a wheelchair,” he said, when asked about why he decided to bring the organization to Loyalist. The Magic Wheelchair project is a lot of demanding work that is only paid off once the costume is given to the child on Halloween, he said. Some stories were less heartwarming and more about the struggles that some people have had to live with. There were stories about challenging experiences that Marshall said it took the participants strength and bravery to share. “You look at someone and you don’t know their story, you don’t know the backstory and you never know if you don’t listen,” Laurie Genereaux, who attended the event, said. Linda Blanchette, one of the live books, told many people about her husband and his time living with post traumatic stress disorder, and what it was really like to be a military wife to a husband coping with PTSD. She now works with helping other people cope with similar struggles. “We started a peer support group up with 10 families, I’ve now worked with over 300 families,” Blanchette said. PTSD greatly effects military families in Trenton, Blanchette said. “Our men are constantly being deployed, and the families are left behind,” she said. The feedback from the event was good said Marshall. “People like the chill environment, we chose the Brake Room because we knew it would have a nice vibe, and be welcoming. We really just wanted it to be laid back and comfortable for everyone involved.